No Thanks, we have our own. Today we visited Goulburn's Lilac City Festival. It was a beautiful Spring day and lots of people were enjoying the entertainment, rides and stalls in the main park in Goulburn. We saw the stall on the left displaying "Peek-a-boo Dolls". I looked at them and mentioned to Lana, "We don't need one of those. We have our own." Sure enough, this evening Rose was denied one of her requests for another piece of licorice. She rushed to a nearby wall and assumed the position. I quickly retrieved my camera and took a photo. Rose looked around and gave me a half serious expression with a trace of smile, and moved further along the hall against the wall on the other side. I sneaked around and took another photo, so she moved further along the wall. It ended up being a bit of a game and she soon forgot why she was pretending to be a peek-a-boo doll and returned to the rest of the family. One does have to admit that the doll makers certainly captured the pose very well. In the dance we mentioned back in July we showed you a glimpse of the dress Ariel and Lana made in action on the dance floor. This photo shows Ariel with two of her friends all dressed with style for the dance. 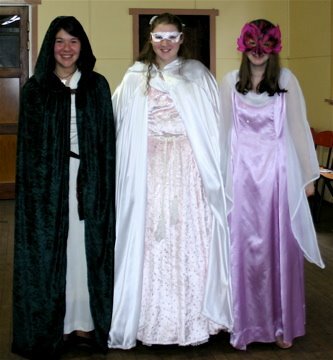 The dress on the right you would have seen on the post for International Fairy Day. Ariel has grown too tall so her friend was able to benefit. The material for the dress and cape were purchased about two weeks before the dance. Lana and Ariel worked together to adjust the pattern to suit Ariel, then sew and fashion the lot in less than a week. I was sent on a mission whilst I was in the city for the buttons, hooks, eyes and clasps for the cape. These were attached the night before the dance. A bit of effort, but well worth it. 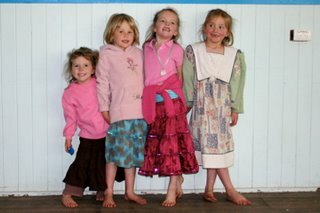 I have been told many a time that it isn't possible for Girls to dress with style in today's world. After all, the only clothes girls seem to be able to buy in the stores are those that are too short or have too little fabric for the money. Ariel actually has a fine sense of style and colour, which she must have inherited from Lana. I have posted previously on some of Ariel's outfits and this is the first of a series of Ariel's dress styles. 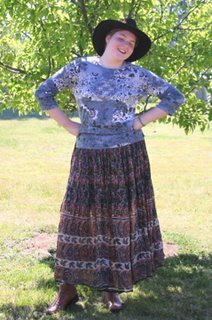 The skirt is of thin material, but has so many pleats that it remains modest, yet light. Being a warm Spring day Ariel has stolen my hat which seems to go with almost anything. There is a new drop down menu on the left column which will group all these related posts together. 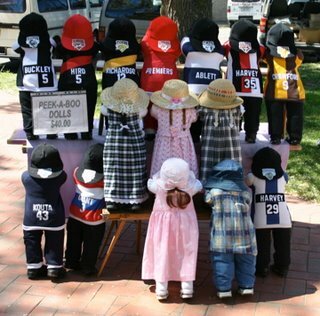 Kim from Life in a Shoe has posted the latest Carnival of Children's Comedy. There are three posts from Bruggietales featuring James, Clare and Rose. I liked this glimpse into the thoughts of a seven year old's appreciation of his mother is at Busy Busy Mommy. This is how we enjoyed our dinner on Sunday Evening at dusk. The children found the whole lack of power thing very exciting and played with glow sticks once it was dark enough. The power finally came back about 7:00 am Tuesday morning. Luckily the freezer kept cold enough and we lost no food. The phones failed when the battery in the local exchange ran out after only 24 hours without external power. So the next purchases for us are a mobile (cell) phone for Lana and a backup generator, primarily for the freezer and refrigerator. Our power has been down for 36 hours, with a forecast 36 hours still to go. Yesterday our area experienced really savage winds. Combined with fires all over the State, powerlines were destroyed, burnt or disrupted by fallen branches or trees. To make things even more of an adventure, today the phones went down around the middle of the day. As our water supply is all locally stored in our own water tanks, we use an electric pump to get water into the house. So - no power AND no running water. Knowing that the first thing to go in a fire is the power, we have back up plans in place. Our stove has a gas cooktop, and we have a gas barbeque as an additional option. We can get water in buckets from the water tanks which we use to drink, hand wash and flush the toilets. The freezer is not to be opened and should keep everything frozen until late tomorrow before some slight thawing of the upper levels may be noticable. Last night we had a candlelit dinner and yesterday we did a lot of non-electronic entertainment. I'll have a photo once we get power back at home. This morning I awoke on time using my "guardian angel" alarm clock (*), and left with a washed face but no shower or shave. I am away with work at a hotel tonight so am in communication with the outside world (and can have a shower tomorrow). (*) As I settle into bed I ask my Guardian Angel to awaken me at whatever time. It works! Even without electricity. I'm Matthew, I'm 3 years old and I tend to be quite naughty. I have a mum, a dad and a 15 month old baby sister, Rebecca (or Becca as Mum and Dad prefer to call her, or Annoying as I prefer to call her). I seem to spend a lot of my time in the naughty corner. I'm not sure why but whilst I try to reach a conclusion on this and many of life's other mysteries, I'd thought I document my adventures in this blog. So Life in the corner is introduced. This is a very humourous view of the world through a three year old's eyes. We've added them to our Interesting Sites link on the side. 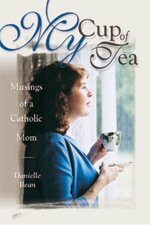 Some time ago we enjoyed reading "My Cup of Tea" by Danielle Bean. I was reminded of this when I noticed a flood of visitors visiting Bruggie Tales from Danielle's blog since we were honoured to be added to her blog roll. The book is a humorous glimpse of motherhood and family life in a family about our size. (You can read the first chapter here) Actually, Danielle's blog is a similar collection of tales to Bruggie Tales. The adventures of a mother and her family of many children, living and loving whilst doing their bit in the world. Welcome to all our new visitors. Feel free to have a poke around Bruggie Tales. We have covered our adventures since we first moved to the US in July 2003 and have now returned home to Australia. Last night at the dinner table I mentioned that we would return to the US in about three year's time for a holiday. To achieve this goal we are saving a set amount each month into a special account so we can ALL go. This immediately led to conversations surrounding how old each of the children would be three years from today. Being a bloke, I figured that was that. Today Lana took a photo of this. A packed bag. Clare is ready to go. 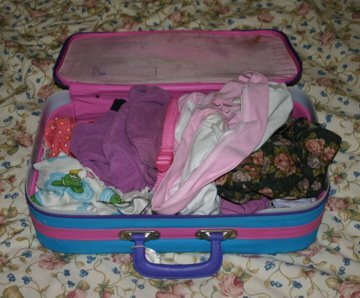 Clare packed a nightie for herself and Rose, 2 dresses and two jumpers for herself and two dresses for Rose. They were all folded up nicely. When Lana asked Clare to change her nightie this morning, she came out in one saying, "This is the one I'm taking to America with me." It didn't click with Lana until Ariel mentioned Clare had already packed her bag. This led to difficult discussions about the nature of time. "Do you know how long it is between one birthday and your next birthday?" Lana asked. "It'll be three of those. You'll be the same age as Peter is now." Lana was rewarded with a blank expression, as if to ask what that had to do with her packing her bag and going to America. Now. Or maybe tomorrow. 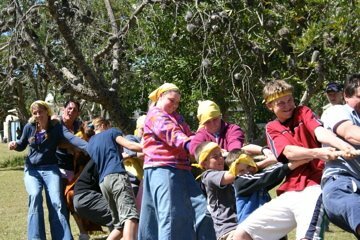 Our post on the Evans Head Homeschoolng Camp comes under Where. 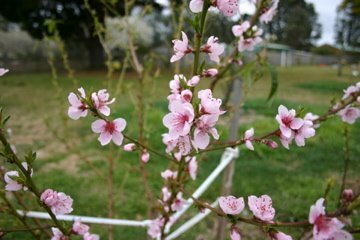 We took this photo of our flowering fruit salad tree before we left for camp. This is a tree with four different fruit branches grafted onto a common trunk - nectarine, apricot, white peach and yellow peach. If we are lucky we may get some fruit this year! Spring has come around and the colder weather is retreating. The fire hasn't been on for a while and the sun has more warmth. The seasons here are different, yet not as distinct as those we experienced in the US. The temperature variance is less and the colours are more consistent between seasons. But we can't decide which we prefer. We really enjoyed the changing colours of Autumn (Fall), Winter, Spring and Summer but we missed the continual green all year round at home. So we'll just thank God for the chance to experience more of the glory of His creation. This ends our series of posts on the homeschooling camp we enjoyed last week. 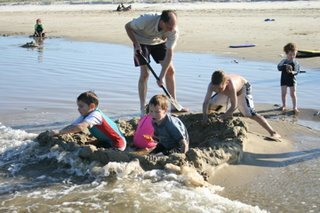 We thought you might enjoy a glimpse of what homeschoolers do when they gather together for a week near the beach. What do Dads do at Homeschool Camps? So there you go. I hope you have enjoyed our little journey. All the homeschooling camps we attend are family affairs where everyone in the family tries to attend. I was very shocked to find this is not so common in the US. Some of the homeschooling events there are for the mothers, with a discount rate for the fathers if they wish to attend and play with the children. So what do Dads do at family homeschool camps? One dad was the microphone man for the sports carnival and concert. He was also involved in some of the pre camp organisation for these events with games and certificates. Here he is hosting one of the games nights and checking his watch for the time left for charades. Father is not actually doing a groovy dance. He is playing charades. Other dads joined in with various activities as sports team leaders, beach patrol and generally keeping an eye out for any mischief that might get out of hand. The dad in this photo is an excellent sand castle builder. The fort was built by him with many helpers strengthening the walls in a valiant attempt to stop the returning tide from reclaiming the castle. Peter is inside the castle helping build the walls while Rose is behind him (in the pink swimmers) playing in the sand and water. I gave a talk on the man as head of the family to a mixed group of husbands and wives. The best part of the talk was the resulting conversation afterwards with many couples sharing their experiences, views and ideas. During the week the dads also had the opportunity to discuss many fascinating topics, well beyond the typical sport and weather. Religion, politics, history and all manner of normally controversial topics were just normal manner of fare. It is just hard to imagine a camp without all the family taking part. 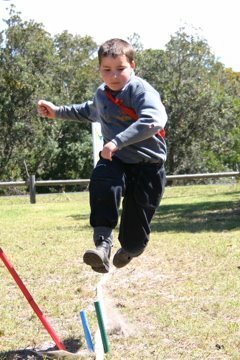 The camp organisers planned a sports carnival for the Thursday morning. With so many children of varying ages at the camp, the children were split across four teams, each team being named after a saint. Running, shotput, peg races and tug of war were enjoyed by all. Each team had a pair of parents in charge just to ensure things went smoothly. As mentioned in my last post, the team of which Lana and I were placed in charge won the competition. 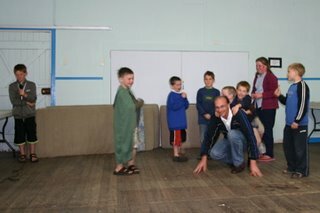 We all participated in the Tug of War - from young to old. As you can see in this photo there was a lot of strain on that rope. The girl at the end holding with one hand had sprained her right wrist but wanted to add her little bit of strength to help the team. As you can see from the head bands, yellow was their colour. Lana's and my hands were sore for the rest of the day! Initially James didn't want to compete. After some "discussion" with me he "volunteered" to participate. Here he is leaping through the air in his long jump attempt. He came first and was happy after all. Some of the funniest races were in the 0 to 2 year old group. With parents or older siblings to assist, the little children participated in every race. Rose actually won the champion of champions in her 0 to 2 year old section. You will have to imagine the smiling - yet bemused - expression on her face as they placed the large medal on a ribbon over her head. There were very professionally printed certificates awarded to all first through third place winners of each race. All the camps we have been to have a Concert. This involves various family members putting on performances of music, comedy, recitations and other feats of derring-do. The Evans Head camp was no exception. The Concert program began with an awards ceremony for everyone that won something in the sporting carnival (which was almost everyone) and the highest scoring team won a large box of lollipops/"Chupa chups." Naturally the winning team was the one lead by Lana and Myself and we take full credit for the win. (Although the children did perform valiantly). Just before the acts, Lana shared out the lollipops to all in the hall. Eric and Peter mentioned something about joining in an act and we didn't realise their earnestness. One of the boys that Peter played with had organised a group of the children to join him in a recitation of "A Fly Went By." 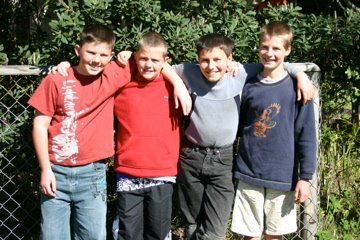 When the act was announced, up went all the boys (each around 7 years old) sucking their lollipops. The act involved him reading - from memory - the story whilst the children walked around after each other as each character. Peter was the fly. The story went fine until one lad tripped over the boy in front. One of the fathers rushed on to the stage to stop the boys scrambling for their lollipops and then kept out of the way. Unfortunately the play came to the crucial part where the "scary noise" was to be revealed. The person who was to play the "scary noise" had been put into bed and wasn't there. So Dad came to the rescue and played the lamb with a bucket on his hoof (the scary noise). He did a very good job too! Other acts had children playing violins, performing Scottish dancing, showing a variety of finger string art, telling jokes, and a special treat - a tribute to Abba. 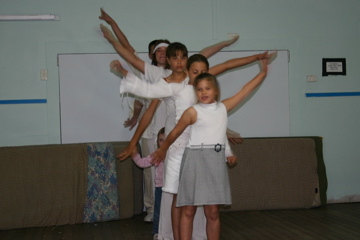 The six older children were all dressed in white and danced to traditional Abba choreography. The littlest one had obviously practised with them beforehand and escaped from Mum's clutches to join in. In this photo you can see the older children all doing a synchronised hand movement thing, with the littlest one taking her place in the middle and doing her part. The concert ended with an act organised by Eric and his mates. This involved making a small pyramid and then falling down a lot. As Eric commented later, "It was a lot funnier when we practised earlier." One good thing about a homeschooling camp is the hordes of children that are around the same age as your own children. As most of the families were large by general standards (4 or more children) there were plenty of children in each age bracket for everyone to find someone their age and size with which to play. We hardly saw Clare during the whole time at camp. 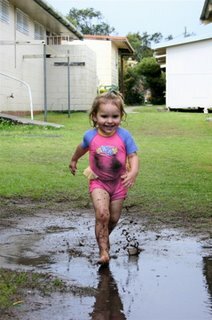 She was playing with her friends in their cabins or around the camp. When we asked where she was, Clare invariably replied, "With my friends." "What are their names?" we would inquire, to which she replied, "I don't know. They're my friends." By the end of the week she did learn their names. This photo is of them all giggling together for a group photo. Eric, meanwhile, was doing lots of activities with his "mates". This meant playing some outdoor games together, exploring the camp, archery, beach fun and even a space wargame Eric had brought along to play. One of the boys remembered Eric from another camp we had attended over three years ago, and they rejoined quickly. There is another lad or two who are part of this group who only attended on one of the days, but as they have all exchanged email addresses they will be keeping in touch until next time they meet. As the families are separated by hundreds or thousands of kilometres, email is the best way to keep in touch between camps. 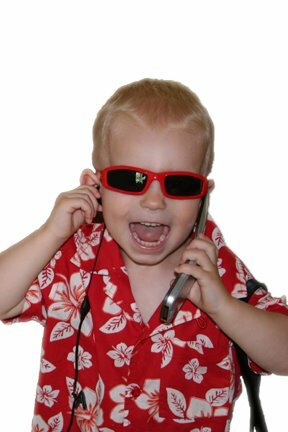 Eric was pleasantly surprised to find that the other boys' parents had also restricted the movies and books to which the boys had seen or read in similar fashion to ourselves. This meant common sharing of views as well as no problems with films or books unseen as it was a common situation. Homeschooling never stops - nature study. As we have mentioned in the past, even though officially we are not doing "school work", education never really stops. This week has been no exception. 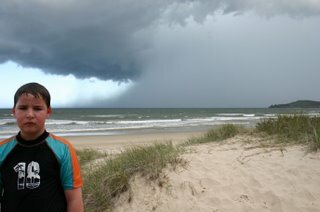 The storm that so disappointed the children gave rise to a discussion how the quick strong tempest causes the nearby river to swell and increase the runoff into the bay on which the beach was part. This would change the colour of the water making it darker and include possible debris and increase the power of the rip or undertow that existed a short way out. On our beach visit the next day we noticed the amazing entrance to a sand crab's house. 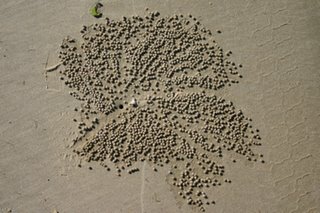 Each of the little balls are just sand and spit from the crab, formed to make room for himself in his hole. As we touched the sand balls they crumbled and fell apart. Once the tide came in the water would cover the hole, but the crab would wait until the tide went out and spit up some more sand balls. 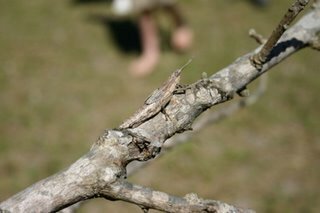 On the day of the camp athletics carnival one of the Mums came over and asked us, "Can you see the insect on this stick?" We all looked and for some it took quite some time to see the stick insect. By positioning my camera just right you can have an easier time spotting him by his silhouette. Rose doesn't like dancing in the actual rain. She waited until it was all finished and then ventured out. Just outside our cabin door was a lovely dirty puddle. "Just Right," she thought and proceeded to run from one side of the puddle to the other about twenty times. Then she missed and fell down with a baseball slide into the muddy water. No problems. Up she went and continued again. It's fun like this and other things she does that make us glad she is not the last of the children. Yes. That's right. Baby number seven is on the way and due to make an arrival in April some time. We are all very excited and the children are very happy their prayers have been answered with another sibling to join them. Naturally, the boys want a boy and the girls a girl. Time will tell. But this is supposed to a Summer camp! One part of the camp enjoyed by the children was the beach being within a five minute walk. On the day of our arrival, we unpacked, had lunch and headed for the beach. The children went first and Lana and I followed shortly after. As we approached we saw ominous black clouds moving swiftly towards us. Just as we left the beach, a police car was racing along the shore line to make sure everyone was off. About five seconds after we returned to our cabin the heavens opened and the rain poured down in a torrent. The children all looked at me as if it was my fault that their beach trip was ruined. I looked at their pitiful faces, then at the rain and said, "It's wet anyway. 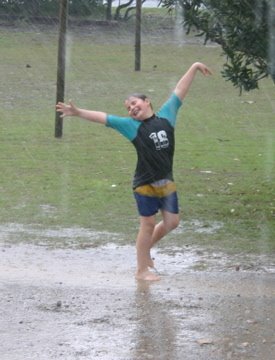 Dance in the rain!" Good idea, they thought and had a good time dancing away. Note James' happy dance now that he was getting wet after all! The rain soon stopped and the weather for the rest of the week was pretty good. 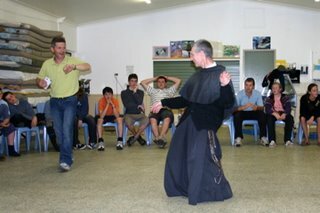 This week we have been away at a Catholic Homeschooling Camp. That is why we have been pretty quiet here. 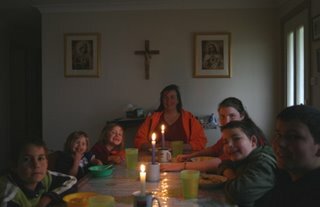 One of the main reasons we went was to have the three older children Confirmed by the Bishop with another ten homeschooled children. Confirmation is one of the seven sacraments and the final sacrament of initiation. As with all sacraments it is an outward sign of an inner reality. The outer signs are anointing with the Chrism oils and the laying on of the bishop's hands, in line with practice mentioned in scripture and continued to this day. The inner reality is the infusion of special graces or gifts. It is a very exciting time. We wanted to get Ariel confirmed when we were in the US but the local bureaucracy had a policy of confirming when the children were in year 10. This has meant that Ariel was the oldest child being confirmed this week, but nothing would move the local parish so we had to delay her confirmation until our return. This is a photo of James being confirmed. 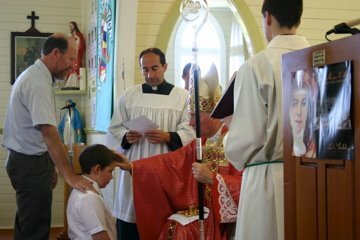 His sponsor has his hand on James' shoulder, the assisting priest is holding the paper indicating the name James has chosen as his confirmation name and the bishop is anointing James' forehead with the Chrism oils in the sign of a cross. During Mass I noticed Clare had her feet out of her shoes. I asked her to put the shoes on properly and she complained they were too small. I examined the shoe and noticed she had a couple of balloons in the toes of each shoe and another stuffed into one of her socks. Clare and her friends had been enjoying playing with balloons and she had discovered the perfect place to hide her stash. 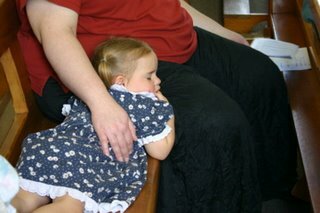 Meanwhile, Rose was just too tired to pay much attention to all the excitement around her. I had the honour of reading from the scriptures in the first reading and the prayers of the faithful. One of the prayers mentioned prayers for N our Pope, N our Bishop and all bishops. I remembered Pope Benedict's name easy enough but my mind went blank for the Bishop's name. After a short brain freeze I made do with "Bendict our Pope, Our bishop and all bishops." Naturally enough as soon as I went to my seat I remembered the Bishop's name. Don't you just hate that?